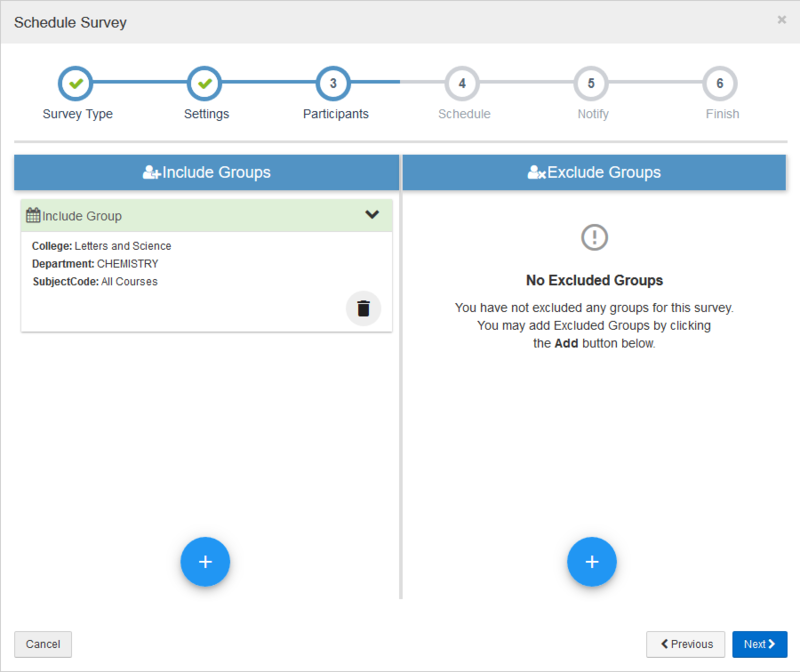 In order to release an AEFIS survey to students or other participants, AEFIS administrators must create a survey schedule. This document describes how to create a new survey schedule in AEFIS. Select Survey Schedules from the left navigation menu. 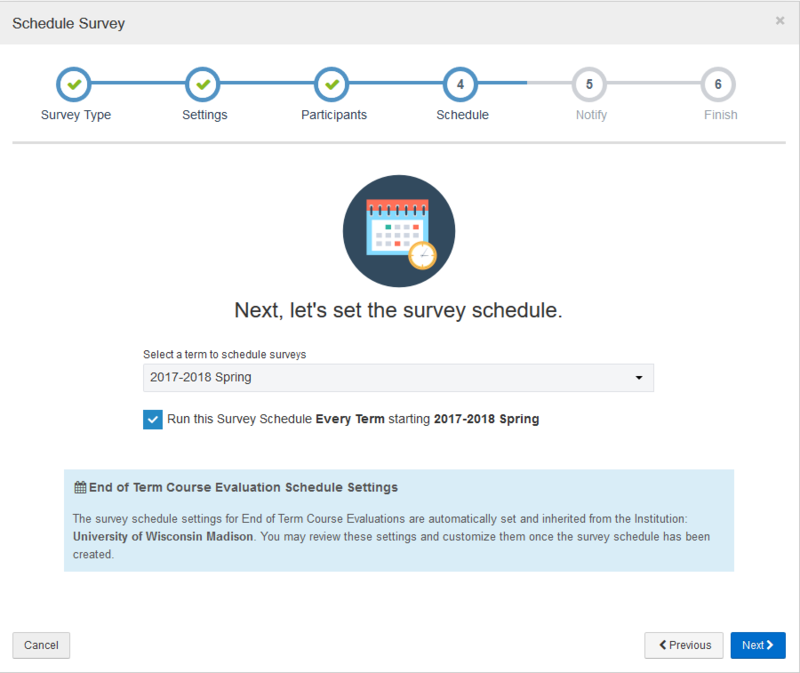 Select the blue Schedule a Survey button near the top of the page to launch the Survey Schedule Wizard. The Survey Schedule Wizard will walk you through six set-up pages. A preview of the questions that are asked on each of the set-up pages can be found below. 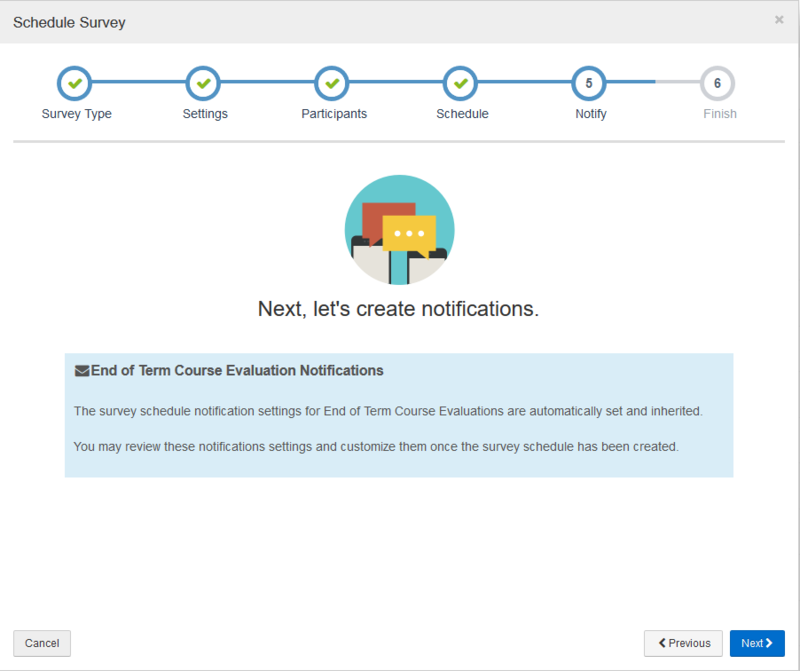 The suggested responses assume that you are setting up a schedule for an end-of-term or midterm course evaluation survey that will be delivered to students. If you are using AEFIS for another purpose and need assistance setting up your survey schedule, please contact learnuwsupport@doit.wisc.edu. What type of survey would you like? : Select Course Evaluation. Choose one of the following: Select Student Course Evaluation. 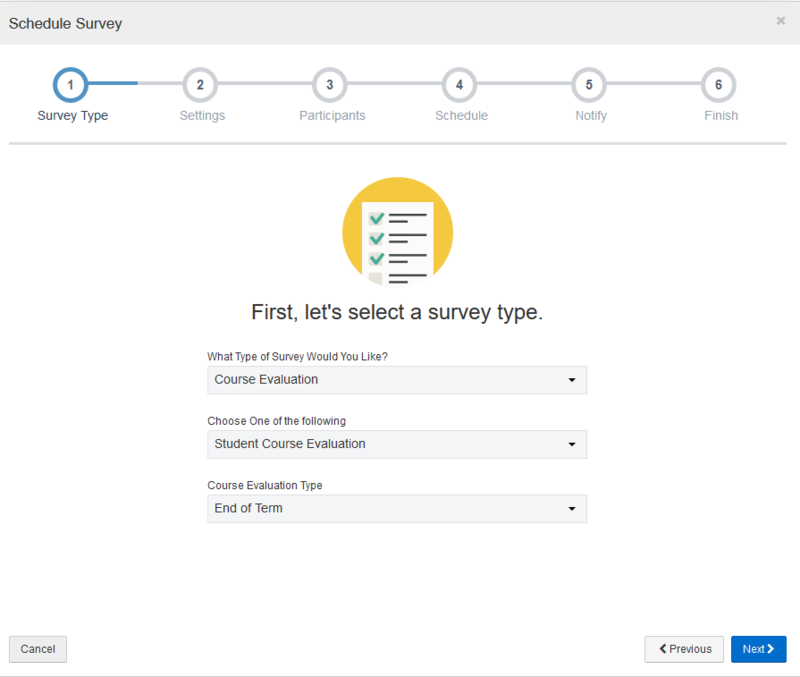 Course evaluation type: This setting will effect when instructors can see their survey results. In most instances, we recommend selecting End of Term even if you are scheduling midterm evaluations. End of term survey results will not be available to instructors until after grades are submitted for the term. If instructors need to see their results before the end of the term, select Middle of Term. You will be able to select the exact date that the survey goes out later in the scheduling process. Enter a name for the survey schedule: Enter a descriptive name. The name will trickle down to your survey instance, which will be seen by students. Do not include course titles in your schedule name. Survey schedules will usually apply to multiple courses in your department. Do not include a specific instructor's name in the survey schedule title. Instructors will be identified elsewhere in the survey, provided you set up your survey schedule with instructor style questions. We recommend setting up your survey schedule so that it runs every semester. If you decide to do this, do not include specific dates or semester information in the survey schedule title. You will not be able to rename your survey after it has been published, so make sure your title is easy to understand and generic enough to apply to multiple courses in your department! 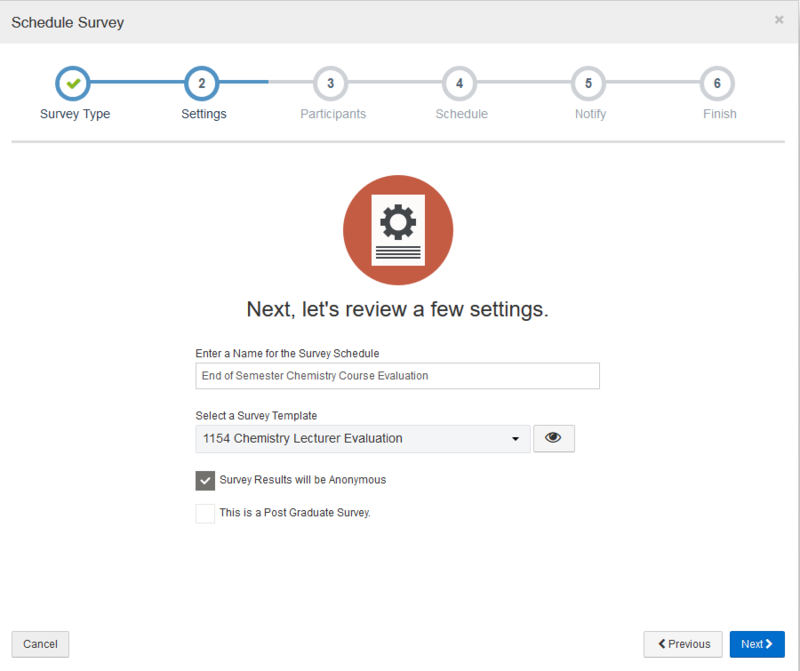 Select a survey template: Choose the survey you would like to distribute to students from the drop-down menu. 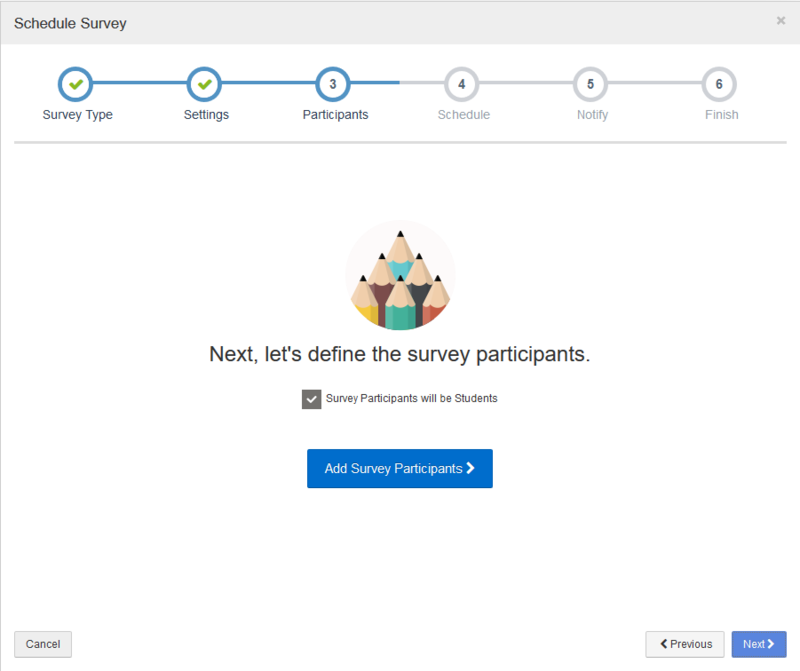 You can preview the survey you have selected by clicking the eye icon. Survey results will be anonymous: This box will be checked for all student course evaluations. You cannot change this setting. This is a post graduate survey: This box will be unchecked for all student course evaluations. You cannot change this setting. Select the blue Add Survey Participants button to begin. Click the blue + button on the left side of the screen to select groups of participants to include in the survey. 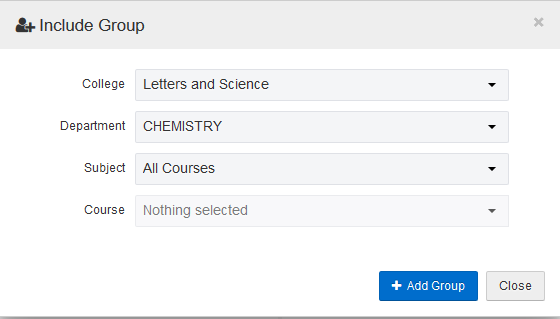 Select your College and Department(s) and click the blue Add Group button. It is best to keep your participant group general at this point and skip selecting courses. The Exclude Group setting is optional. If there are courses that you will never survey, such as independent study courses, you may choose to add them to the exclusion list. Otherwise, you can skip this step. 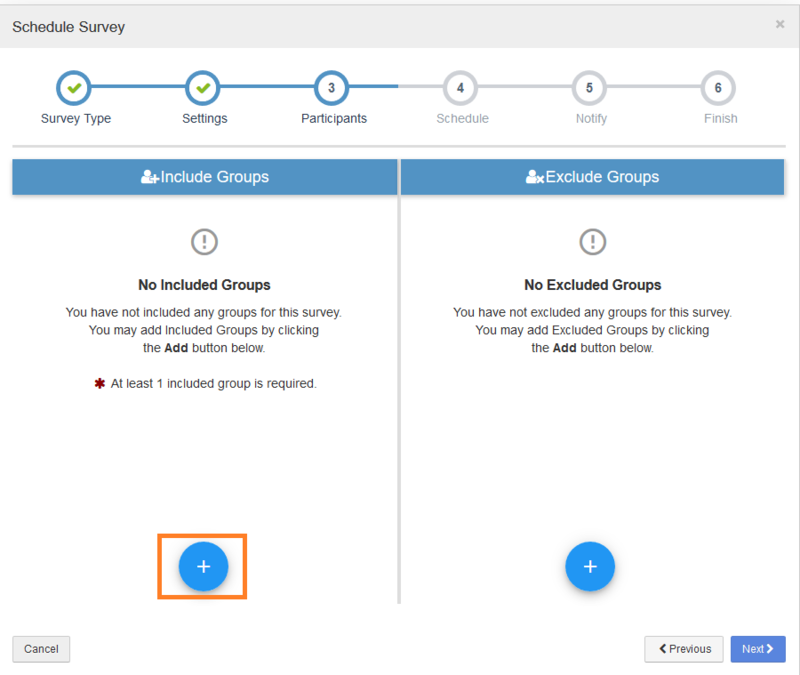 Confirm that you have selected the correct participant groups to include and exclude. Select the blue Next button to continue. Select a term to schedule surveys: In most instances, you should select the current term. 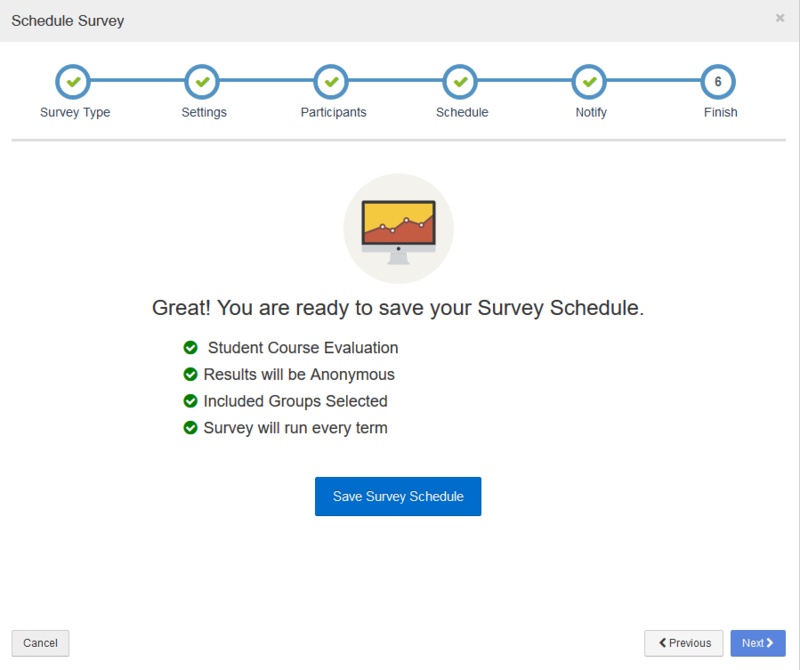 Run this survey schedule every term: If you plan on using the same survey template every semester, check this box. You will then be able to skip creating the survey schedule in future semesters. Survey notifications are set at an institutional level. Select Next to continue. Select Save Survey Schedule to save your schedule. 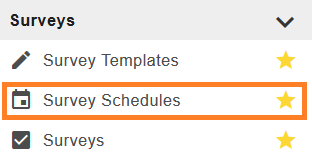 Select Save Survey Schedule to finish creating your survey schedule. After you complete the set-up wizard, you will be directed to the editing page for your new survey schedule. The survey schedule will be in Draft status. Publish it by selecting the Publish button to the right of the survey schedule title.